Make More is a festival for makers and creators. An incredible first-time event in a leafy part of Victoria Park, Make More is transforming the park into a paradise of the arts. Think pottery fairs and demonstrations. Giant loom weaving, followed by immersive theatre. This festival specialises in highlighting the lifestyle and the sheer skill of the maker's community in London and we are proud to have been asked to be a part of it! Botanical Boys, Darren and Ben will be with us for the whole festival. When they are teaching, they'll be showing you how to create miniature gardens inside a jar. They'll encourage you to use your imaginations and get your green fingers wiggling. The Botanical Boys will be teaching their classic make a Miniature Eco-System in a Jar class. Drop in for a mini crafter party led by Maiden Aunt where you’ll create a bold statement necklace using laser cut wood pendants. Learn how to decoupage, embellish with metallic leaf and make your own swishing tassels. Perfect for when more is more and you want to elevate your look (read: always). This is a lite version of our usual crafter parties but as with all Maiden Aunt workshops, they are a world away from the classes you did at school. You’re encouraged to talk to each other, doodle, daydream and even enjoy a drink (no pranks on the teacher though, please). Leonie studied fashion and design at the University of Central England and then went on to build a successful leather accessories brand. She's coming to Make More festival to teach you how to make a beautiful leather tassel keyring. This is a fun workshop aimed at giving you an enjoyable first-time experience making a leather accessory. You'll have your choice of leather, gold or silver hardware and a choice of designs. Leonie not only wants you to make something you are happy with, but she wants to inspire you to work with leather in the future! Mary Maddocks is a textile artist based in South East London. Her work combines a passion for woven crafts with a lifelong love of the natural world; she creates wall hangings and woven jewellery inspired and informed by natural landscapes, colours and textures. This workshop will provide you with everything you need to know to create a beautiful piece of woven wall art on a frame loom. This watercolour painting class is taught by Elizabeth, who specialises in vibrant boho floral prints. This watercolor class is taught in a very friendly and relaxed environment and welcomes anyone who is curious to learn how to use the wonderful art form of watercolour painting. All materials will be provided, so just come as you are to enjoy learning a brand new skill. There is a maximum of up to six people per class in order that Elizabeth can spend enough time focusing on each individual. 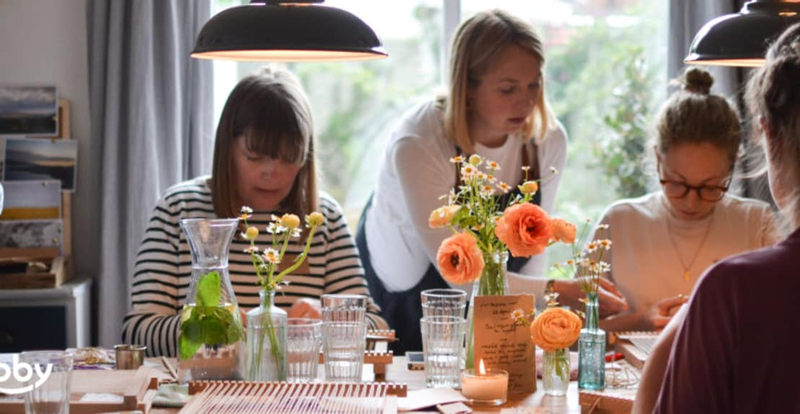 Freya from Paperwilds will be doing paper-marbling demonstrations throughout the festival in the Obby pop up, but she'll also be teaching bookbinding. In her classes, you'll be using leather to make this delicately sewn book into a durable object that will last a lifetime of being flung into a handbag or a suitcase (even longer if you keep it on one of those fancy shelves!). Built to be battered, this notebook is meant for USE. Freya is an advocate of the nearly extinct art of paper-marbling and is one of only two paper-marbling. Jodie and Jordanne from J&J workshops will be teaching a jewellery stamping workshop. You'll be able to personalise your very own tiny aluminium disk with your own message, decoration or pattern. J&J Workshops is made up of two extraordinarily talented jewelers, who pass on their skills as a team to others. This class is an introduction to one of their normal day jewellery workshops. You'll be amazed at what you manage to create with them!